The following sample requires identification. Those with further knowledge in mycology or microbiology are encouraged to respond. 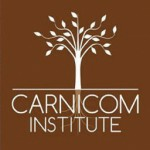 If any readers believe that they are able to identify the following materials, please respond with email to info@carnicominstitute.org or post a public message on the message board. Thank you. I believe this is a form of Slime Mold that seems to thrive in bark mulch. I live in New Jersey and have seen this in all my mulched beds for the first time this summer. 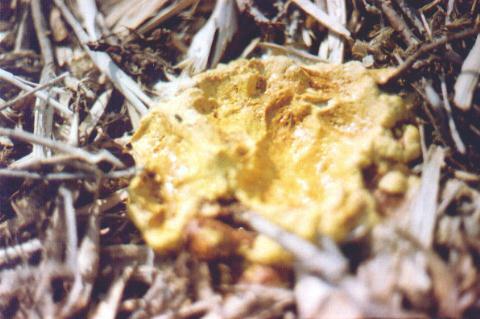 We did have an unusual amount of rain and lack of sunshine this summer, which may contribute to this mold’s abundance. 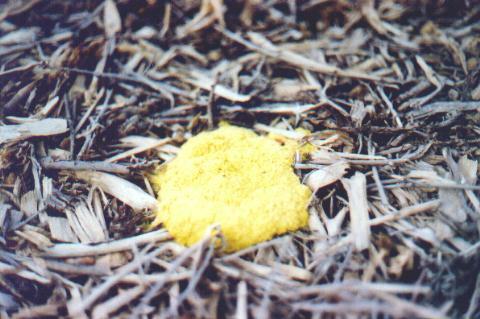 If you did a web search on “slime mold” there is a lot of info about it. 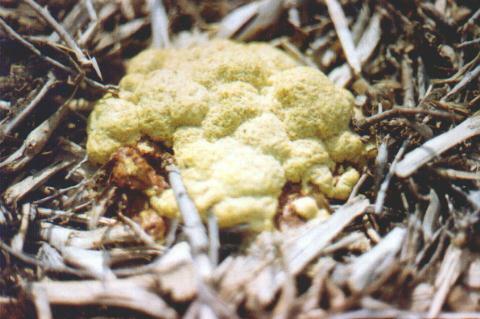 It has been described as looking like dog vomit when it is in the “blooming” stage. The following three photographs show a certain material which has appeared twice within approximately two weeks at essentially the same location (separation of approximately 3 feet in horizontal distance on the ground). This is an area of a backyard that has been mulched with bark. 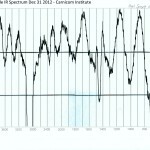 All appearances are that this material has originated from the ground and at this time no association whatsoever is made with aerial activity. Nevertheless, it will he helpful to have this material identified by someone with knowledge. The material is described of being of a ‘chocolate mousse’ texture, and the foam like nature of the material is shown in photograph number 3 of this series when a portion of the material was removed for collection. The Environmental Protection Agency of Albuquerque (apparently city division) has received a portion of this material and thus far apparently has treated the subject of identification in a jestful manner. The three photographs shown in the series below were taken immediately prior to collection. 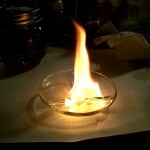 An identical sample of this material appeared approximately two weeks ago at almost the exact same location, however, the collection process was contaminated to where that sample is generally unusable. The most likely explanation at this point appears to be a fungus of some sort, however, I am unfamiliar with any material of this form or that thrives in the desert environment of Albuquerque NM. Original material undisturbed at ground level. Material after disturbance during collection. 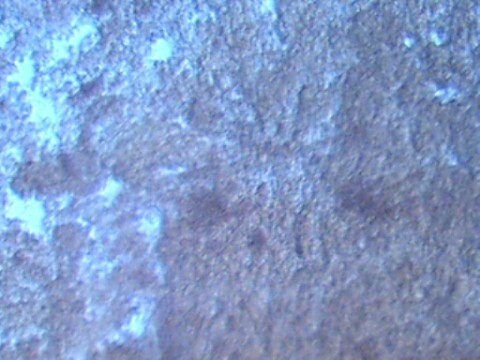 The following two microphotographs show the appearance of the material described above at approximately 480x magnification. 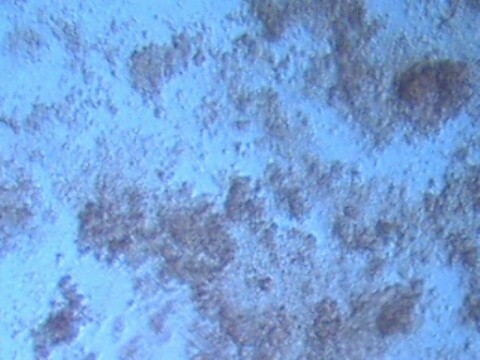 There is little definite structure to the material at this level of magnification, and the individual cells or components appear to be extremely small, estimated at 1 micron or less.